Nathan is the 2015 Management Undergraduate of the Year with Enterprise Rent-a-Car! Since getting over the shock of winning, we asked Nathan about his experience! My name in Nathan Craig and I am fortunate to be the winner of the TARGETjobs Management Undergraduate of the Year Award 2015. I decided to apply to the process in late January as a result of receiving an email from my university careers service. Normally I would just skim over my emails, but the award caught my eye in this one and immediately struck me as an excellent opportunity. I have a keen interest in the automobile industry and have always fancied myself as a sales person. Therefore, the fact that a placement with Enterprise Rent-A-Car was up for grabs suited me to a tee. I was invited to take three tests – occupational personality, situational judgement and inductive reasoning – within the next few days once I’d submitted my application. After a week or so, I was contacted by a talent acquisition manager from Enterprise Rent-A-Car who invited me to participate in a telephone interview. I tend to get nervous over the phone, so I kept myself as busy as possible up until the last minutes before the interview. The interviewer really was a calming influence and I was able to find my stride quickly. This resulted in me being invited to an assessment centre a few days after the call. The assessment centre was a great experience. I like to think of Enterprise Rent-A-Car as an iceberg company: there is a lot more that occurs out of sight than you can imagine! I was genuinely surprised by the friendliness of all the people I met at the assessment centre – other candidates as well as current Enterprise Rent-A-Car employees. I felt I was able to express my personality throughout the day, which was action packed and a great learning experience. Many of the assessors had once been in the same position when they first joined the company. This was a comforting fact and also demonstrated the scope for career progression at Enterprise Rent-A-Car. I received an email within the next few days congratulating me on making the top ten candidates and inviting me to the awards ceremony in Canary Wharf. This was definitely a high point as it was an impressive achievement to make it this far in the process. The final was an unforgettable experience and a welcome break from revision. At the ceremony, hosted by Fiona Bruce, I was able to network with successful candidates from other assessment centres as well as more Enterprise Rent-A-Car employees. After a three-course meal, the winners for each of the awards were called. I was nervous when Fiona Bruce was announcing the shortlist in my category, perhaps because I knew what a great achievement it would be to win this award. As the winner, I was presented my award by Jim Burrell, a remarkable man who has contributed vastly to the success of Enterprise Rent-A-Car in Europe. All in all, I have had a very positive experience, from applying in January to winning in April. I am looking forward to my placement with Enterprise Rent-A-Car and, in particular, the week I will have in the USA. I would encourage everyone to apply to this award because it is a fantastic experience regardless of the outcome, and of course you have to be in it to win it! 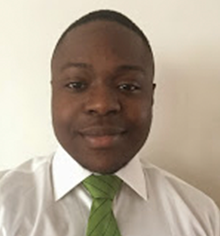 Since winning the Management Undergraduate of the Year Award in 2015, I have decided to explore another industry, despite having a successful and amazing experience with Enterprise Rent-A-Car. Using the range of transferable skills I picked up and developed while at Enterprise Rent-A-Car, I have used these to secure a graduate job in banking. Had it not have been for my internship with Enterprise Rent-A-Car and winning the award, I am not sure I would have had the skills, nor the experience, to have the luxury of choosing which industry I would like to pursue a career in. One of the most important skills I developed while interning with Enterprise was the confidence to back myself and my decisions. This has stood me in good stead when leading a team or taking control of a project. Another key skill that I picked up while at Enterprise Rent-A-Car was networking. Being able to network and hold a conversation with senior employees is an excellent skill to gain, regardless of what industry path you choose to go down. The awards ceremony itself still brings back fantastic memories and I am still in touch with many of the other candidates who made the top ten and those who I undertook the internship with. The Undergraduate of the Year Awards offered me the chance to meet and network with like-minded individuals and begin to build my professional network. Added to this, the experience of applying, completing tests and interviews has helped me when completing future job applications. If you are contemplating entering the Awards, wondering if it will be worth your time or even still deciding which career path you would like to go down, I would strongly advise you apply to the relevant category. The Awards provide a fantastic application experience and the opportunity to meet inspiring people who can help you along the daunting path to employment.